A bit early, but it’s the last chance I’ll get. Thanks for reading! I’ll leave you with another great post from Stuff from the Park. 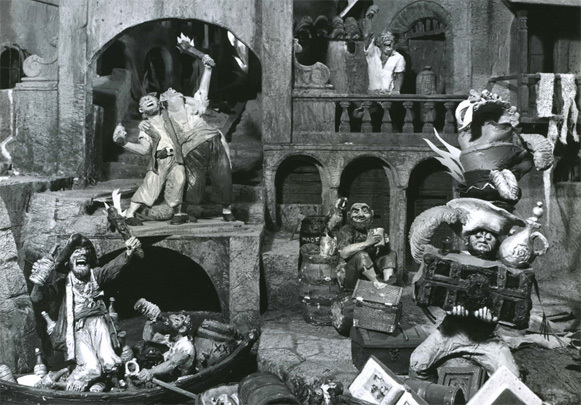 Not only does he have a fantastic poster from Disneyland, New Year 1962 but there’s also a fantastic photo of the Pirates of the Caribbean model used in the 1965 Disneyland 10th anniversary show. 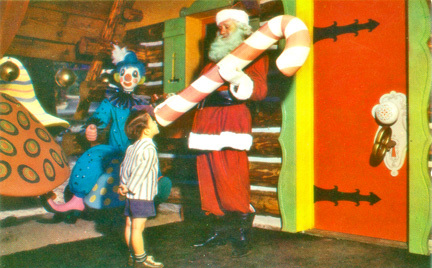 I’d never heard of Santa’s Village… boy, have I been missing out! Thankfully, Jordan Reichek fills me in… and Google helps me find even more crap than I could ever dream of! Apparently, the park opened in 1955 (the same year as Disneyland) or 1957 (depending on what reports you read!) and closed in 1998. Santa’s Village Lives in Memory. Update: I’ve also just noticed this fantastic collection of images from Universal City Studios in the 60s and 70s on the same site. It sure was a lot smaller back then, and it looks like that flash flood has been “scaring” visitors for over 25 years! Have a root around further for shots of Knotts Berry Farm and Ghost Town and Will Rogers Park. Pokemon Diamond/Pearl Best Selling Pokemon Title, Ever! Nintendo has announced that Pokemon Diamond & Pearl is the best selling title in Pokemon history in Japan, selling over 5 million units in less than three months. The game(s) is released in the US in April and Europe shortly afterwards. World of Warcraft dorks will love this t-shirt Wonderland’s Jen got this Christmas. Happy Winter’s Veil! Classic Disneyland fans are going to love the Stuff from the Parks blog. Over the past few days they’re put up a huge amount of fantastic stuff, including photos of Walt Disney and storyboards from the Submarine Voyage, Nature’s Wonderland models, Matterhorn models and retro Christmas parade shots. I just wanted to take a moment to thank everyone for reading over the past couple of months. This is the first time I’ve really taken this blog seriously and, hopefully, it’s an improvement over the ones I’ve done in the years past. I hope you’re enjoying reading as much as I’m enjoying writing. Finally, posts may be a little patchy over the next couple of days while I roll around the floor, filled with food, but Antikewl Daily will be back to normal after the holiday break. Antikewl Daily on MySpace: I set up an account for Antikewl Daily on MySpace a short while ago. If you’re a MySpace user, feel free to befriend it. Tokyo DisneySea’s Tower of Terror: The Japanese version of the Disney attraction Twilight Zone “Tower of Terror” opened in September at Tokyo DisneySea in Japan, but I didn’t realise that it had it’s own site. I can’t read Japanese in any form but the site is incredibly atmospheric and portrays the plot visually so you should have no problem following along. Dropping the Twilight Zone references for this version, the attraction is based around an eccentric billionaire who disappears one night taking the elevator back to his quarters after taking a mysterious idol of the trickster African Spirit, Shiriki Utundu.